The axillary nerve is a major peripheral nerve of the upper limb. In this article, we shall look at the anatomy of the axillary nerve – its anatomical course, motor and sensory functions, and any clinical correlations. Spinal roots: C5 and C6. Sensory functions: Gives rise to upper lateral cutaneous nerve of arm, which innervates the skin over the lower deltoid (‘regimental badge area’). Motor functions: Innervates the teres minor and deltoid muscles. The axillary nerve is formed within the axilla area of the upper limb. It is a direct continuation of the posterior cord from the brachial plexus – and therefore contains fibres from the C5 and C6 nerve roots. In the axilla, the axillary nerve is located posterior to the axillary artery and anterior to the subscapularis muscle. It exits the axilla at the inferior border of subscapularis via the quadrangular space, often accompanied by the posterior circumflex humeral artery and vein. Posterior terminal branch – provides motor innervation to the posterior aspect of the deltoid muscle and teres minor. It also innervates the skin over the inferior part of the deltoid as the upper lateral cutaneous nerve of the arm. Anterior terminal branch – winds around the surgical neck of the humerus and provides motor innervation to the anterior aspect of the deltoid muscle. 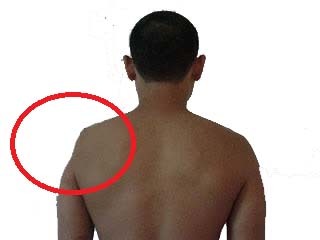 It terminates with cutaneous branches to the anterior and anterolateral shoulder. Lateral – surgical neck of humerus. The axillary nerve and posterior circumflex humeral artery and vein pass through the quadrangular space. These structures can be compressed as a result of trauma, muscle hypertrophy or space occupying lesion; resulting in weakness of the deltoid and teres minor. This is particularly common in athletes who perform overhead activities. Fig 2 – Posterior view of the shoulder region, showing the quadrangular space. The subscapularis muscle lies anteriorly, and so cannot be seen. 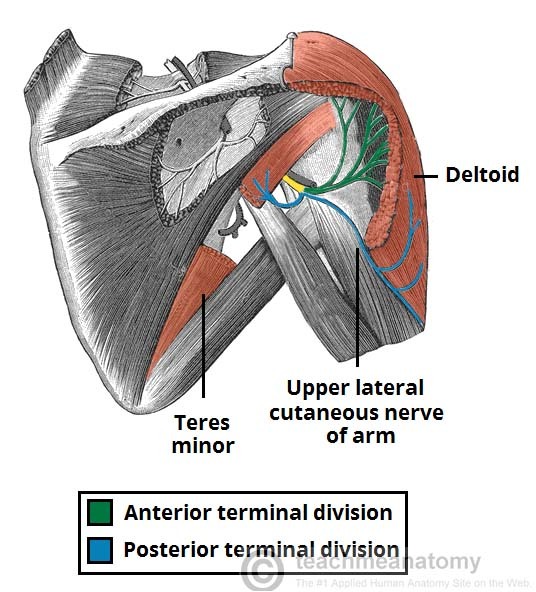 The axillary nerve innervates teres minor and deltoid muscles. 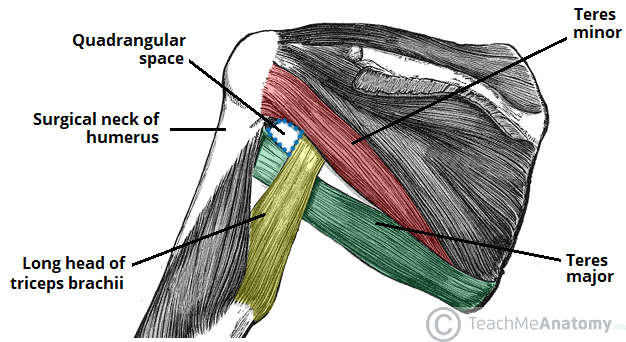 Teres minor – part of the rotator cuff muscles which act to stabilise the glenohumeral joint. It acts to externally rotate the shoulder joint and is innervated by the posterior terminal branch of the axillary nerve. Deltoid – situated at the superior aspect of the shoulder. It performs abduction of the upper limb at the glenohumeral joint and is innervated by the anterior terminal branch of the axillary nerve. NB: There is some evidence from research on cadavers that the axillary nerve can also innervate the lateral head of triceps brachii muscle. The sensory component of the axillary nerve is delivered via its posterior terminal branch. After the posterior terminal branch of the axillary nerve has innervated the teres minor, it continues as the upper lateral cutaneous nerve of the arm. It innervates the skin over the inferior portion of the deltoid (the ‘regimental badge area’). In a patient with axillary nerve damage, sensation at the regimental badge area may be impaired or absent. The patient may also report paraesthesia (pins and needles) in the distribution of the axillary nerve. Fig 3 – The sensory innervation of the axillary nerve. Known as the regimental badge area. The axillary nerve is most commonly damaged by direct trauma to the shoulder or proximal humerus. Common mechanisms of injury include fracture of the humeral surgical neck, shoulder dislocation or iatrogenic injury during shoulder surgery. Motor functions – the deltoid and teres minor muscles will be affected, rendering the patient unable to abduct the affected limb. 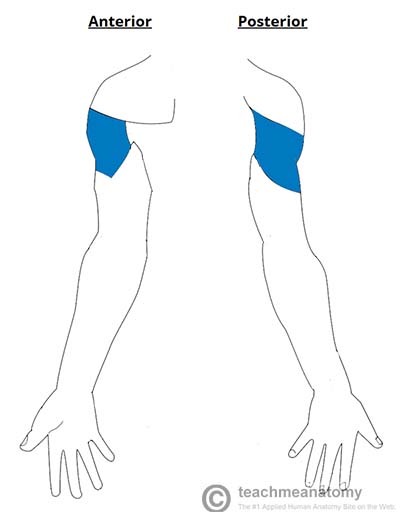 Sensory functions – the upper lateral cutaneous nerve of arm will be affected, resulting in loss of sensation over the inferior deltoid (‘regimental badge area’). Characteristic clinical signs – in long standing cases, the paralysed deltoid muscle atrophies, giving the shoulder a flattened appearance, and the greater tuberosity can be palpated in that area. Erb’s palsy is a condition resulting from damage to C5-C6 roots of the brachial plexus. The axillary nerve is affected, and the individual is usually unable to abduct or externally rotate the shoulder joint. It commonly occurs where there is an excessive increase in the angle between the neck and shoulder, which stretches (or even tears) the nerve roots. The illustration below shows a patient with long-standing axillary nerve palsy. 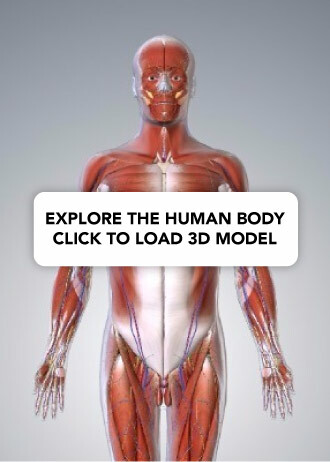 Which muscle has atrophied? Which vessel accompanies the axillary nerve as it passes through the quadrangular space? A patient undergoes a shoulder arthroplasty. Post-operatively, the patient reports numbness in the distribution of the axillary nerve. Which branch of the axillary nerve is most likely to have been affected?